Today I am sorting through my closet and getting together my Fall 33 (It is more than 33, I use Courtney’s P333 as a guideline). I love Thrift Shops and Secondhand Stores. 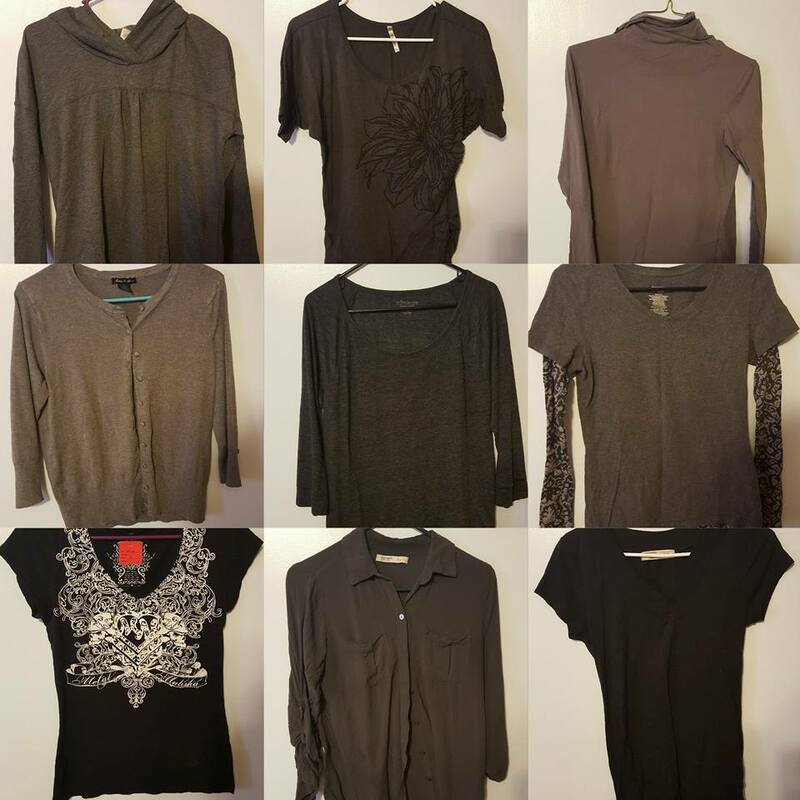 I have added 8 new items to my wardrobe this season for under $30. One of my favorites is this scarf I snagged for $4. It can change an outfit in a second and it is very versatile because of its colors. As usual I begin by putting all of my clothes in one spot and start sorting. One pile for this season, one pile for storage (and under the bed storage bag), and one pile to be donated. Then I hang up all the clothes I want for this season and separate by type. 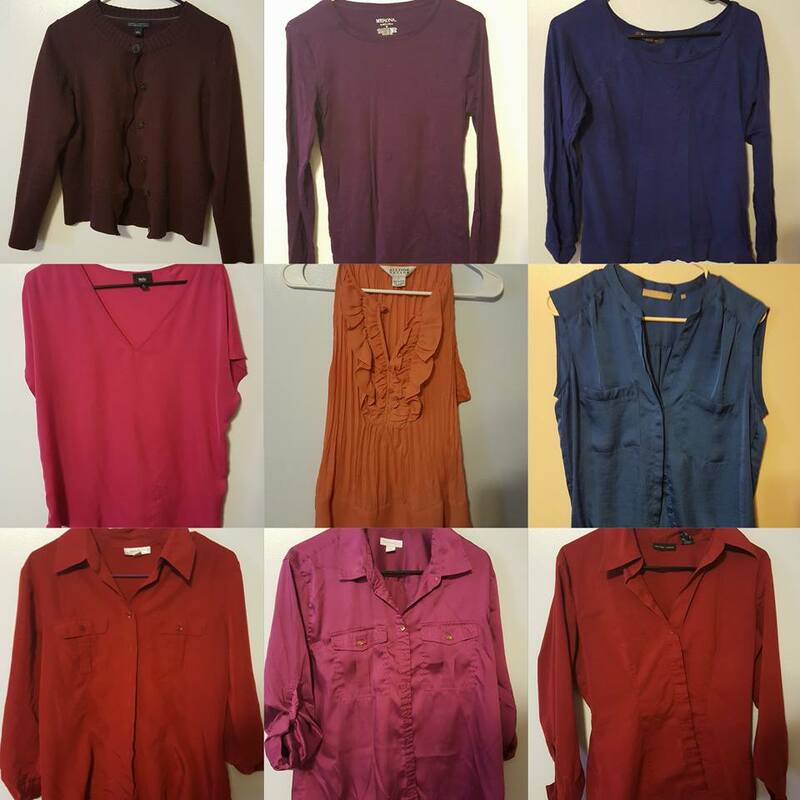 Work, short sleeve, long sleeve, sweaters, pants, dress. Then I see if I have way too many of one type (do I really need 12 work shirts when there are only 5 work days in a week?) In the end I always feel better and more organized. 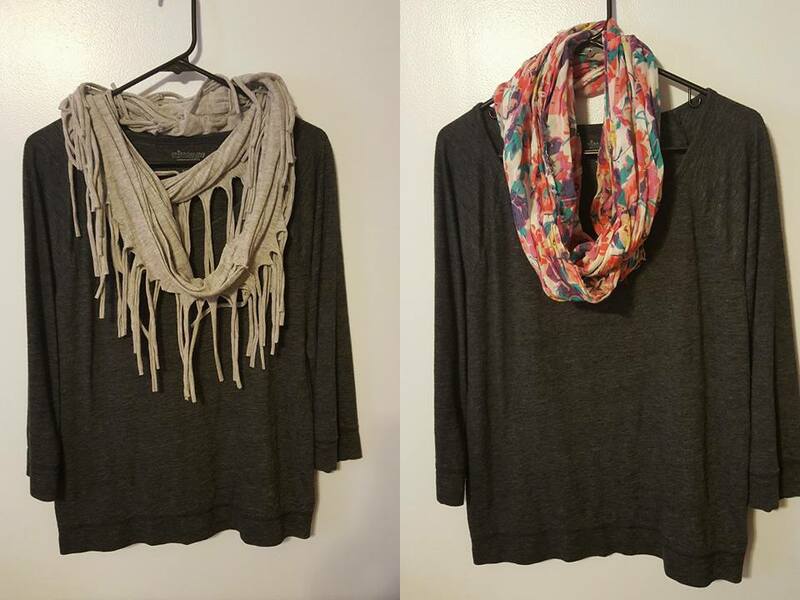 It was so nice to see some of my favorite fall clothing and add it to the new items. A rule I stick to in every season, in with the new means old must go too! For every new deal I find while Thrift Shopping, I get rid of something that is torn, I never wear, doesn’t fit well, etc. Last month I gave over 3 trash bags of women’s, men’s, and children’s clothing to a local outreach. If you have read my latest post you will see that I have tried to step up my wardrobe a little bit this summer. I have always liked fashion, I just haven’t always been able to dress age and style appropriate (we all go through fazes). “How to Get Dressed” is an amazing book I just finished reading that is from the perspective of a self made Costume Designer. She goes through every one of her secrets that she has learned from years of making people look good and scene appropriate on sets. The author shares lots of DIY tricks and tips to make your clothes look and fit great. 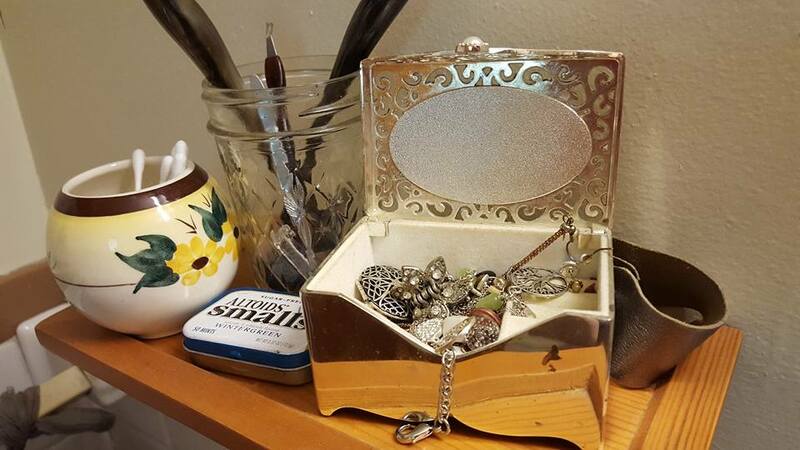 One that I cannot wait to use is her homemade wrinkle release spray. Combine 1 tsp liquid fabric softener, 1 tsp rubbing alcohol, and 1 cup distilled water in a spray bottle. (test on small patch of fabric before spraying entire garment). 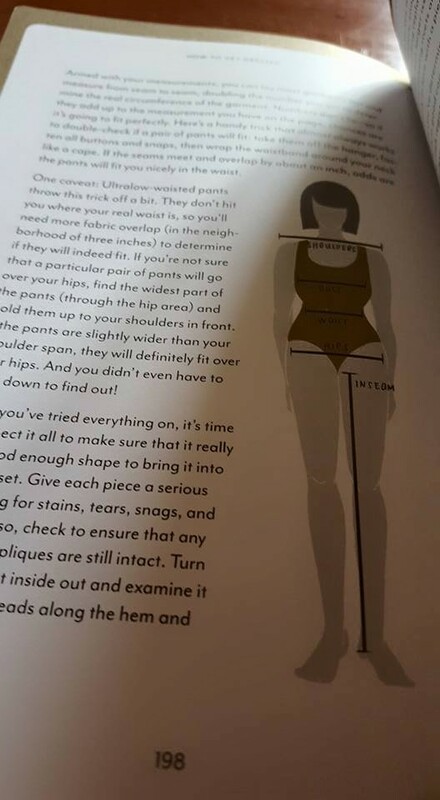 One of my favorite quotes from this book was, “Skinny is not a goal, it is a type of jean.” She teaches you how to find and make clothes fit you, instead of fitting the clothes. Flattering is key. Not squeezing into something that wasn’t made for your body or personality type. There is even a handy glossary that tells how to remove different stains from clothing and a guide on how to care for specific fabrics. 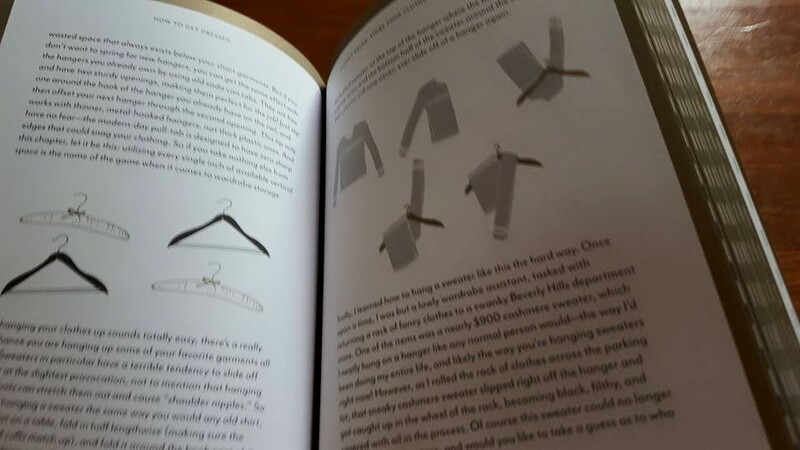 In Chapter Two she even breaks down each type of clothing into categories and what to look for in a fit or when shopping. Here she talks about measurements that help when shopping for the right fit. After telling a funny story about a cashmere sweater tragedy, Alison explains how to hang items up properly. Hanging everything helps keep the quality of your items in tact and you can more easily see everything. If you are looking at updating your style or just want to make sure that you are doing everything you can to look and feel great in your clothes, this is the book for you! If you have never heard of Project 333, please go check it out. It is amazing!!! This summer is very different for me. 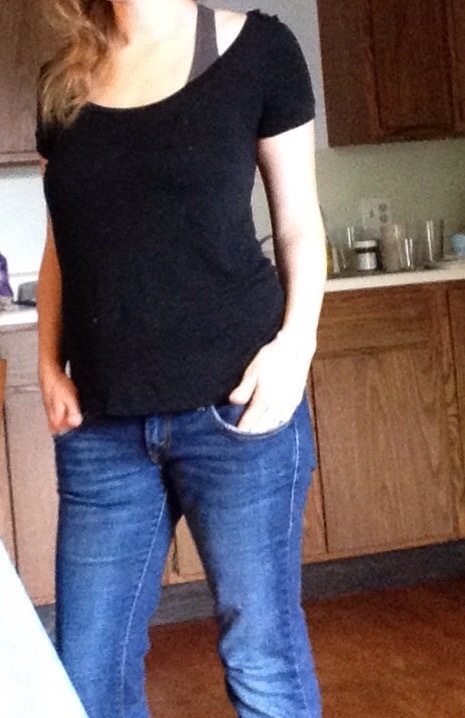 I no longer am pregnant (ya for normal clothes) and I have updated my style significantly over the last year. I also have been taking a break from P333, so it is nice to jump back in. 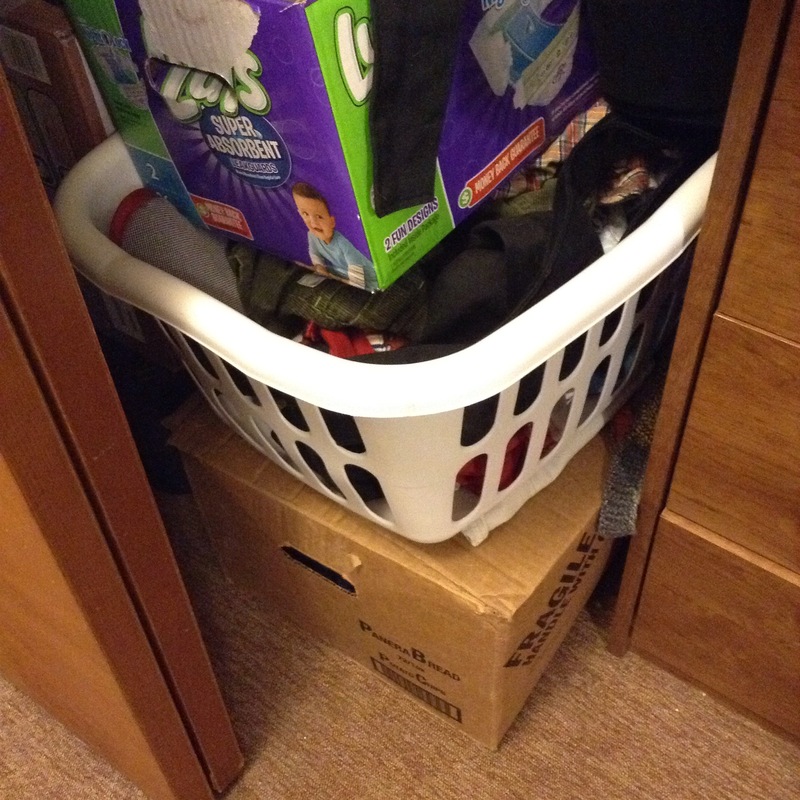 I do not include PJ’s, Workout clothes, accessories, undershirts, or shoes. I also do not include my work clothes since I do not wear them outside of work ever. 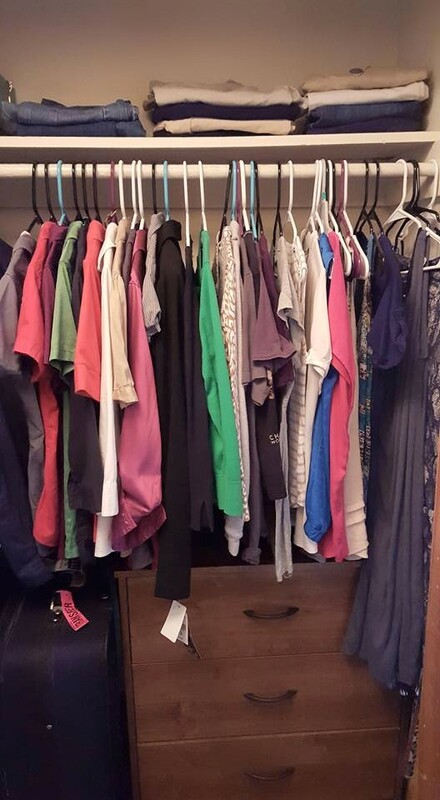 It is my spin on a minimalist closet and it is what works for me. The biggest benefit I find is that I feel like I went shopping every time to switch out clothes. I get that excitement and do not become bored with my wardrobe. It is also helpful to not have to look through a bunch of clothes that are out of season or no longer fit. Pictured is 20 pieces that I chose for Spring/Summer. 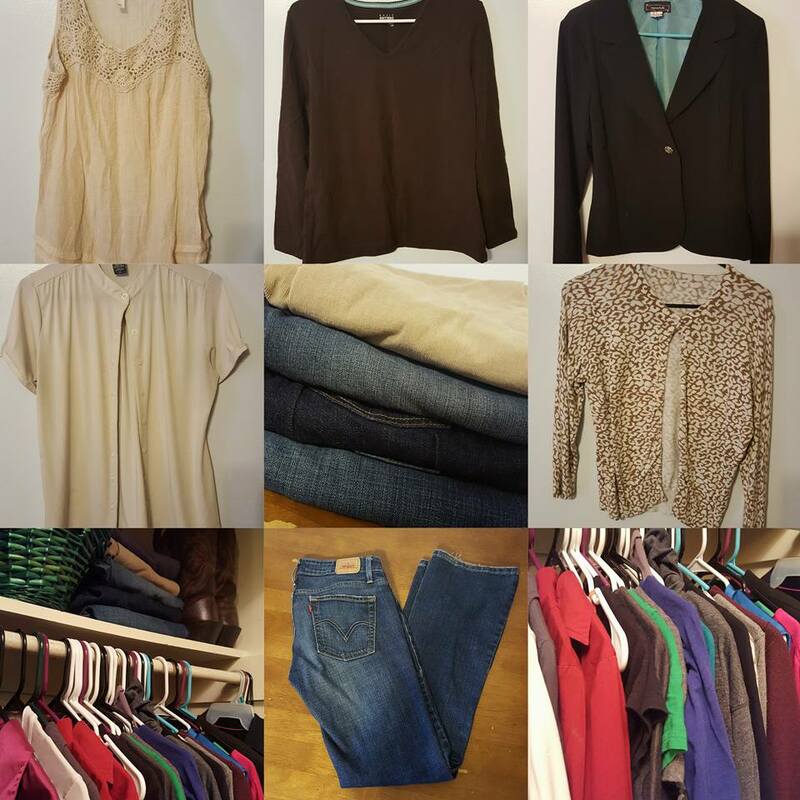 I also have my 3 pairs of jeans (year round) and a few pieces that were in the laundry that I might keep out for a few more weeks until it gets warmer. I love the blue dress. Still brand new from the end of last summer. I also went thrift shopping and several of the shirts and shorts are “new”. I think I spent a total of $25. 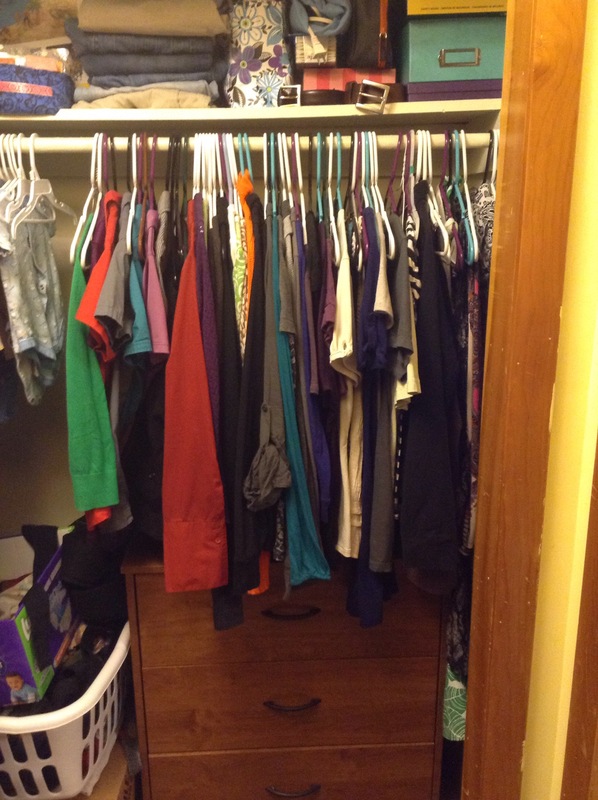 Below is our closet. On the Left is my side, on the right is Hubby and Little Man’s things. 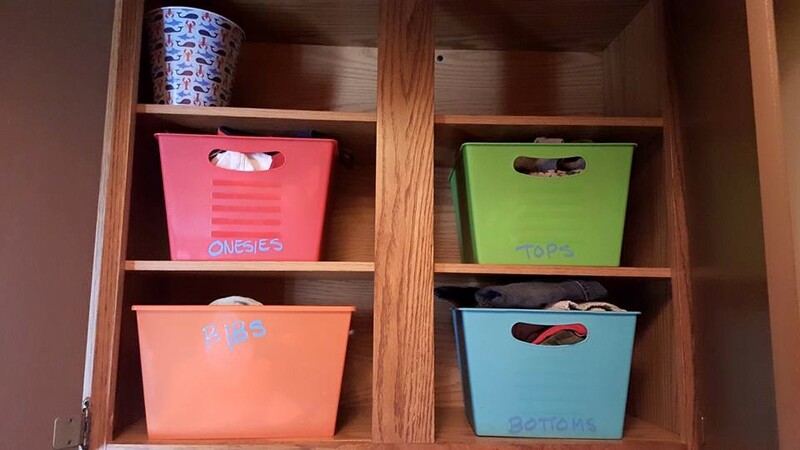 I picked up these colorful bins at the Dollar Tree the other day. They are perfect for Little Man’s clothes. I labeled them with a chalk marker (it will wipe off when I’m ready to use them for something else). 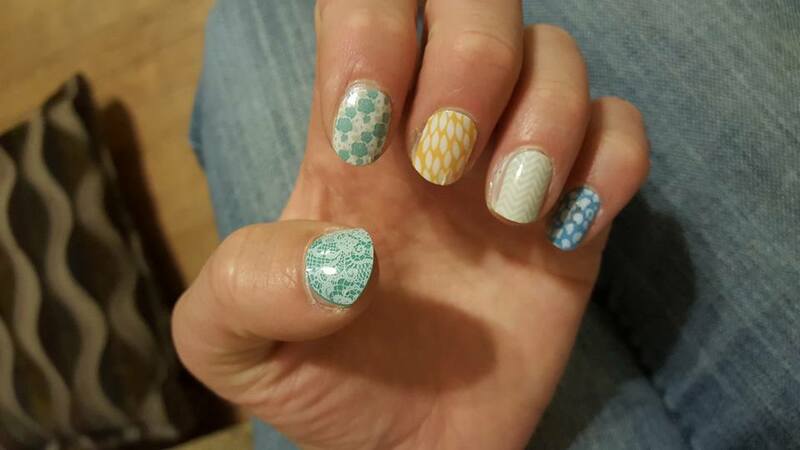 After having my son and finally being able to fit back into my clothes again, I was so excited to make my next set of 33. As I was sorting through for my fall clothes, I was a little overwhelmed by the 3+ boxes of clothes that I owned beyond my summer only clothes. As I looked through shirts I hadn’t worn in years and pants that may never fit these hips again, I decided it was time to purge. I put anything that a 30 yr old mom and women pursuing her career would never be caught dead in, to the side. (I’m not thirty yet, but I’m trying to get into classic styles and away from college trends). Then I tried on all pants and got rid of any that didn’t fit. Ouch! I could have set them to the side, but I don’t want to set unrealistic goals. I have larger hips now. I just birthed a child. It is ok that I will never fit into those skinny jeans from junior year again. After the purge was complete, I put all of my shorts and strictly summer shirts (only a few that I don’t want to over wear) into a box. 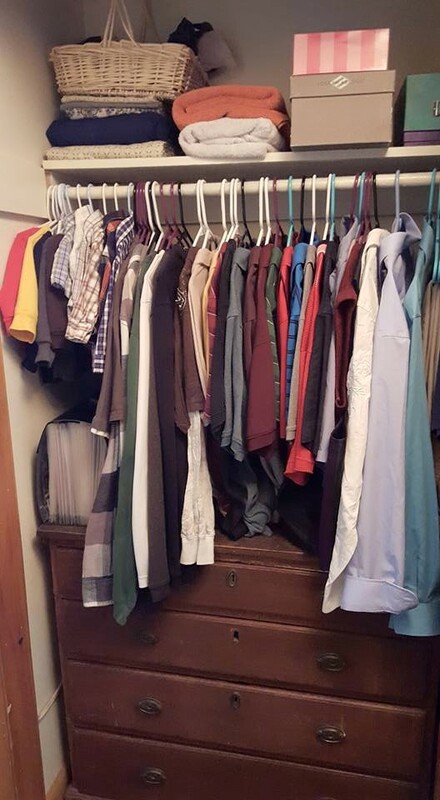 The rest of my clothes went into the closet. Either hung up, in my three drawer dresser, or folded on the top shelf.